BlenderBottle, online at blenderbottle.com, is the destination for shaker cups and supplement storage systems. BlenderBottle offers big savings on shaker cups and supplement storage systems. BlenderBottle carries shaker cups, water bottles, durable jars, expansion packs, combo packs, bottle sleeves, replacement parts, recipes, apparel, and bags. Check out RetailSteal.com for the latest BlenderBottle discounts, BlenderBottle carries items that allow you to live a happy and healthier lifestyle. 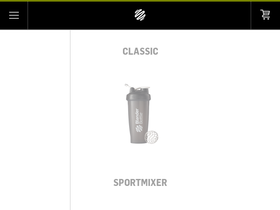 BlenderBottle promo codes, and BlenderBottle coupon codes. BlenderBottle offers shipping promos that change often. Stop by RetailSteal.com for the latest BlenderBottle shipping special offers. BlenderBottle delivers to the United States and internationally. Act now and save up to 35% off a great selection of accessories from Blender Bottle online. Shop BlenderBottle Classic from $9.99 at BlenderBottle. Click here to shop. Enjoy free shipping on orders $30+ at BlenderBottle. Click here to shop. Enjoy exclusive promos with email sign up at BlenderBottle. Click here to sign up. Shop BlenderBottle SportMixer from $14.99 at BlenderBottle. Click here to shop. Visit blenderbottle.com and get a BlenderBottle sportmixer at just $15. Click here to shop. Shop at blenderbottle.com and get a "Do You Even Lift" t-shirt for only $12.99. Click here to shop. Shop at blenderbottle.com and get a classic replacement cup for just $3. Click here to shop.